Facebook Group | My journey on becoming full-time designer. 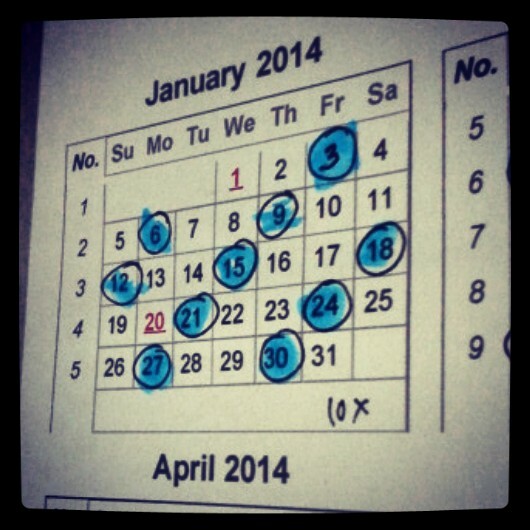 Post 11: Resolutions Review! 111 to go! Design career– Well I have been trying to get into new projects and more painting. In one of my previous posts you can read about my sources of inspiration, so I did few sketches of bearded men after doing the very important research and I ended up with a face of Charles Darwin on my wall. I reckon one more session and then he has to go. It has been freaky at the beginning, but now it feels he is part of the room. I do not want him to become too comfortable. I thought I will start on a new project by now, but my work schedule has changed, plus other activities and being ill at the beginning of the month made it harder. There have been few offers since then for small commissions, but they have not been fully requested, so I guess, see what happens. The January project has not worked out, but I guess I know the reasons now, so see if I can make it work from April time. As they say ‘Learn from making mistakes’. Lastly I just would like to say I am so proud of myself for doing the tax return in December as I for the first time did not have to suffer with the stress of deadlines and it felt pretty good. A lesson learnt?! Blog every three days– Although I am writing this post two days later, I think I have done pretty well, posting as I should be. My arty buddy Tim is helping in keeping me aware of it every three days. It has been great having a bit of that time to breathe and actually focus on my writing making the post little more interesting and useful to others. I guess although predominantly I write for myself, I need the audience to keep me going. Translating blog into Czech– Well this has been an issue for me. Around the Christmas time I have put out there into online world a request for a translator to translate my posts or correct them into Czech. But I soon realized that translating is almost as writing. There is a style and compare to interpreting, where you can clarify who says what and how they mean it, with translating unless you know the author very well, it can become very difficult. I am still working on the draft of my first post as I want to make sure it will be perfect and it will set a certain style for the rest of them. Social networking– I have run out of my £25 free voucher for Facebook advertising, but I have not had a chance to review the numbers yet, so I guess that will be topic for another post. I had some technical issues with my e-mail, so catching up with everything became lot more difficult. As it suddenly appeared few weeks ago, over the weekend it also suddenly disappeared, so hopefully I can get on with everything as usual. Regarding my Czech blog I decided to start new Facebook Group for Czech and Slovakian bloggers including anyone , who is interested in languages, travels, culture etc. First I left it open, but it soon became apparent it needs a bit of admin work to keep the posts relevant. The group now has around 30 members, so if you know anyone, who likes to blog and is interested in Eastern European countries, send them to here. Teaching and interpreting– There has been a great improvement! I had quite a few sessions with my young chef. During the last one we had during his afternoon break, I spoke to his boss, and he was really pleased with his improvement, so that made us obviously both very happy. He is clearly making a mark in the kitchen and it is not going unnoticed. I had another two people possibly interested in lessons, so again see what happens. Last session we were learning about different meat cuts, last night I was going through list of all kinds of lettuce and selection of mushrooms. Although being here for many years since teaching privately it has also challenged me personally as I actually need to learn the exact translation or simply new words. Sometimes it proves difficult as I cannot find the right Czech word or nearest equivalent. Another great news is I have been approached by a new language agency to do more interpreting work. So far the working relationship has been great, so hopefully there will be some ongoing work. Learning how to drive– With my driving there has been some kind of improvement. I feel like a bit frustrated as it is not as big one as I would like to, but at least there is something happening. So far I had five sessions and although it does not feel as stressful being in the car anymore and I even drove up to 40 mph, I am having a trouble with ‘up and down hill start and stop’, so that is, when my panic appears once again. Regarding the theory test I properly gone through the first chapter, which does not sound like a lot, but at least I have picked up the book. I need to do more progress on this in February, me thinks. New people, new opportunities– Being more open to saying ‘yes’ and catching up with friends have been quite succesful I believe. I have made the effort of meeting up with few of my friends, attended nice little engagement evening catch up and met up with few new people I have been introduced to over the recent months. One of my personal resolutions of being more patient is definitely working and although having little wobble at the end of the month, I have been impressed with myself. One of those nice “yes” moments was when I agreed to go and see the new film Wolf of the Wall Street, however choose carefully who you go to see it with. It is certainly one of those ‘age 18 and over’ films. Learning Autocad, Sketchup, creating a website, saving money– Nothing really new there, as it is not on my priority list right now, but I will see if I can do any research on possible future steps. Post 10: This Time All About Languages! 112 to go! Since I was catching up with the previous post in the last few days and getting back to the normal life after such an exciting weekend, I have not really been up to anything arty as you would expect. But I have been up to another two different things, I guess both related to languages. As you know I have also a Czech version of my blog and my last post was all about the feeling you have, when someone else translates your own words. Well I still have not heard back from the young man, so hopefully I did not scare him off too much. It did make me wonder what to do about my traffic and how to get other people commenting, not just my friends. I had a long search on Facebook and ‘Tinteweb’ for groups of Czech or Slovakian Bloggers. There were only very few and some of the content, rules or amount of people were not exactly that great. This afternoon I had another lesson with my young chef and we studied all different kinds meat cuts and verbs related to cooking. I have to say I am pretty clueless, when it comes to which part comes from where, so as long as it can get to my plate, I am pretty happy. Therefore I had to sit down and do quite a bit of research before the lesson. And what have I found?! There are quite a few different diagrams, but certain name cover different areas, all depending on, which country you are in. So I came up with one in Czech, French, British English and American English. You would be surprised once you start comparing it. And as he informed me there is even lot more to it, so we are both on a hunt for more information. I searched the usual links, which search engines came up with, but if anyone knows, which book your local butcher learnt from or anything useful on that subject, I will appreciate it very much. For now we compared beef, pork and lamb meat. 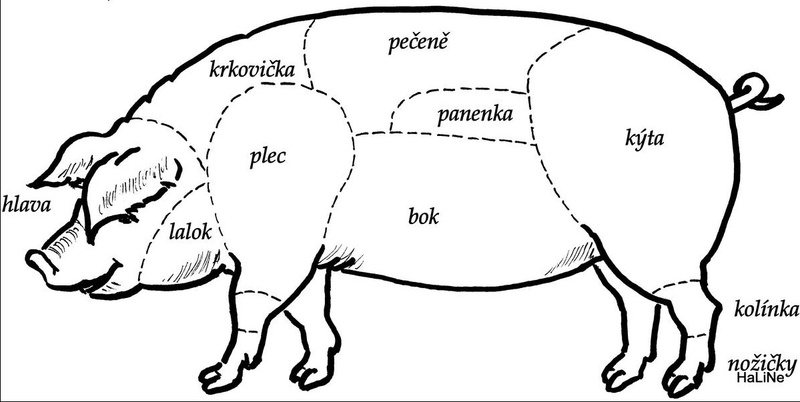 When talking about the pork it was actually hilarious, because the picture of British pig was very lean and it had none of that belly fat as two images of the Czech pigs. He explained (and complained) how the amount of fat in pig’s belly effects certain recipes and why is that. But it was fairly funny once he pointed that out. Have a little look for yourself. Tip me over and pour me out.